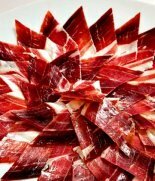 Extremadura is a paradise for lovers of pork products. 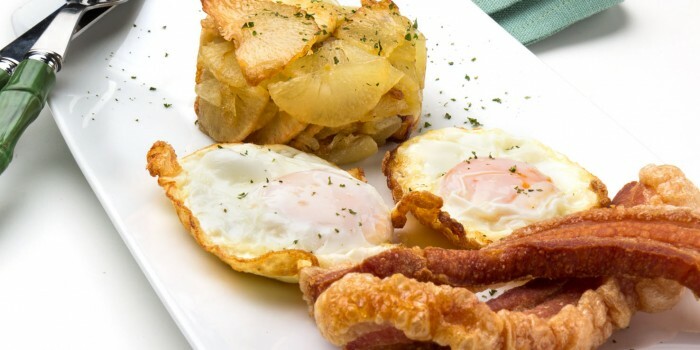 The exquisite torreznos, or fatback from the iberico pig, is not available in the United States, but I have had good results making this dish wiht fatty bacon or an end cut of domestic fatback, which usually contains streaks of lean meat. In a skillet, heat 3 tablespoons of the olive oil over high heat. Add the fatback and fry, turning constantly, for 5 minutes, or until crispy and golden brown. Using a slotted spoon, transfer the fatback to a dish and place in a low oven. Reserve the oil in the skillet. Return the skillet to high heat. Add 2 slices of the jamon serrano and sauté, turning once, for 30 seconds on each side, or until the fat edging the ham glistens. Transfer to the dish holding the fatback. Repeat with the remaining two ham slices. Heat 1 cup of the olive oil in another skillet over high heat. When the oil is hot, fry the eggs. When you finish cooking each egg, transfer it to a plate and keep warm in a low oven (2 eggs to a plate). As you fry the eggs, gradually replenish the frying oil with the remaining 5 tablespoons olive oil, adding a little before you fry each egg. When you have finished cooking the eggs, season them with salt. Distribute the crispy fatback and ham evenly among the places and serve immediately. 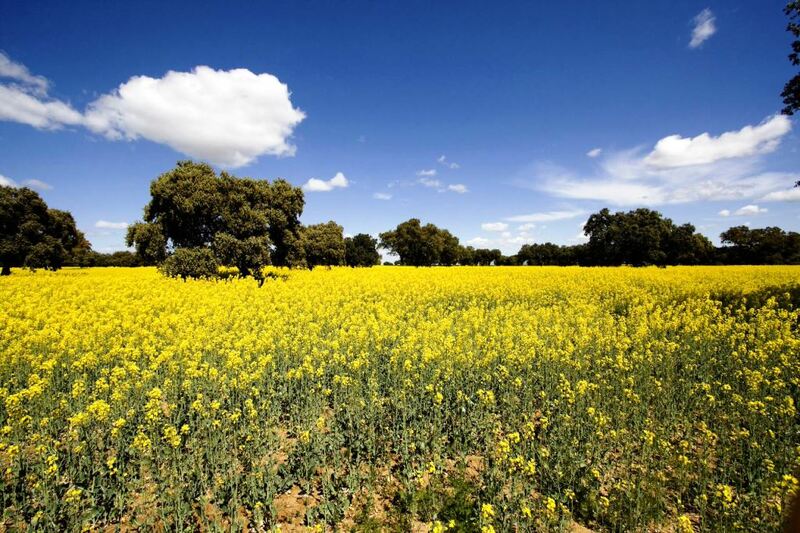 Extremadura recipes: The Extremaduran countryside never ceases to amaze the visitor, with its dry plains, luxuriant pastures, mountains, marshes, meadows and fields.... In each area there are different products, the crops and livestock influencing the local dishes.